Ayurleaf herbal is a company that manufactures premium herbal & food supplements products in India that are synonymous with quality. With a passion for natural remedies and healthy living, we are one of the very few companies that have an astute understanding of the science of Ayurveda and we apply our understanding with cut throat technological advancements to produce an elite product line that is efficacious, safe, validated and reliable. Since our onset in the year 2009, we have witnessed that the herbal products industry in India, lacks a quality manufacturer that has the expertise and the infrastructure to procure the finest herbs, conduct research and development in house, store and manufacture herbal medicines without compromising on quality standards. It was then that we decided to enter this extremely challenging field and cater to the rising demand for quality herbal products on a global scale. Our exporting countries are USA, Australia, Netherlands, Germany. Our company has achieved wide reputation through admant approach of our mentor Mr. Hussain. His effective managing and marketing skills have enabled us to maintain long term tenure with our clients by providing transparency at all discreete level of productions and clients dealings. The vision is to multiply the opportunity of Ayurveda in the world of medicine. We are in a social vision to teach the importance and manipulate the availability of Ayurveda in the common to see a healthy India. Quality is the final thing for us. It is neither compromise able nor be the second option at any case. In the manufacture we are almost maintaining all the major policies given by food and drug corporation. Our mission of our business is not focusing any financial point. Our strategy is social. We are taking the responsibility of quality to fulfill the social need. AyurLeaf Herbals has a dedicated digital platform where there is an ever-increasing opportunity for wholesale/bulk buyers of Ayurveda products and medicines. We are geared to provide mercantile facility for them to reach out to patients worldwide. The e-commerce section is designed and developed to attract manufacturers, dealers and pharmacists who provide Ayurveda remedies for common ailments like joint pains, Psoriasis, conditions like diabetes, stones in kidney, digestive disorders, painful piles and health disorders of varying kinds. Register in our e-commerce marketplace and gain access to the world of healthy Ayurveda benefits at reasonable prices. Our dedicated team will serve as a vital link between the dealer and patients, specific manufacturers & dealers, distributors and stockiest fraternity. This continuous chain implies that every patient can find a medical remedy on an urgent basis where ever in the world they are based at rock bottom prices. We are providing a synergy of various access, online communication, and safe payment gateway for all parties. Should you need assistance in making enquires or furthering your business network we strongly suggest that you come online with the brief. Our business is primary in international markets in US, Middle East, Africa, Spain and UK. Domestic business largely relies on retail and bulk buying from authentic traders. We operate in the Middle East from Dubai, UAE. The company is called Nazba International Trading FZC and is based in Ras Sal Khaima, UAE. Our large consumer base in the region is satisfied with our remedies. We have been able to fulfill the need of overseas buyers and also provide the best opportunity for taking care of the health issues affecting them. If you have an online business dealing in Ayurveda medicines and wish to collaborate with us, this is an open invitation. With acceptance of our website policy and legitimate licenses to operate you can conjoin with us to do online sales with us. We are willing to drop ship your products to the customers from our end. Do get in touch with us to know how we can initiate and further the business with relevant agreement with our company. We are apparently playing four roles to reach you; manufacture, supply, trading and export. Before joining with us never be hesitate because we are assuring about our quality before knowing you. Its our responsibility to meet you with a better health condition. What is it that defines the quality of an herbal medicine? No, the power and potency of any herbal formulation lies in the quality of the herb and the manufacturing process that prevents its nutrients from being lost during production and retains its effectiveness during storage and dispatch. Is it the fancy packaging? Or is it the color of the capsule that one swallows? Ayurleaf has a multi tier quality control system that verifies and analyzes the quality of our herbal products at every level ensuring that the end product is as potent as the source herb. The best teamwork comes from men who are working independently toward one goal in unison - James Cash Penney. We have always been choosy/careful about the people whom we associate ourselves with. Be it doctors, researchers or junior level staff, only the best make it to the Ayurleaf team. Our panel consists of highly skilled and motivated professionals that include pharmacists, doctors, Ayurveda health specialists and scientists who constantly strive to push the limits and produce products that can safely provide long term solutions to our customers. Everything from the sourcing of quality potent herbs to the research and development to chromatographic fingerprinting is carried out inhouse to ensure that our stringent quality control measures are implemented at every level of production. 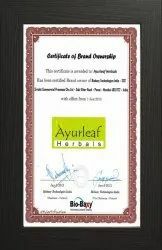 Ayurleaf Herbals is powered by Biobaxy Technologies India, which is a leading pharmaceutical company with a global presence. For the last 15 years, Biobaxy has been the chosen supplier for generic pharmaceutical medicines, Neutraceuticals and herbal formulations in the overseas market. The company has an impressive clientele in several countries around the world including Mauritius, USA, UK, the Middle East and parts of CSI countries.